This mouthwatering, super moist chocolate cake, is a homemade chocolate cake topped with a silky chocolate cream cheese frosting. 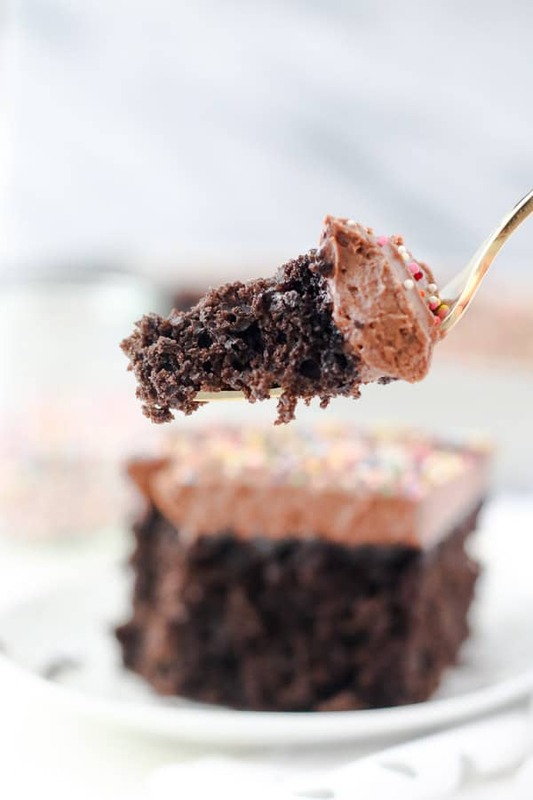 The chocolate cake just melts in your mouth, it’s a light and fluffy cake that stays moist for days. This is a recipe you have to try! I feel like this cake has been a year in the making. Many of you requested a chocolate version of my moist vanilla cake. I tried several different variations, and nothing seemed to be working, because my standards for chocolate cake are very high. 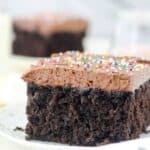 There are a couple of homemade chocolate cake recipes I’ve tried that I love, and nothing was coming close. So I tabled the project for awhile. Last weekend I decided to give it another try, and I NAILED it on the first try. I couldn’t stop thinking about that chocolate cake all weekend. I couldn’t believe how good it was. Just to be sure that it was right, I made it 4 more times, making small tweeks along the way but nothing compared to that first one. My coworkers tried a lot of cake last week, providing feedback on the ones I thought were contenders. 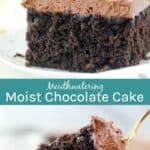 This moist chocolate cake is perfect. It is super light and fluffy, but very moist, which is exactly what I wanted. It reminds me of my favorite doctored cake mix. The chocolate flavors isn’t overly sweet or intense, which is kinda of nice because once you add the frosting, it’s the perfect balance. Choosing a frosting was no easy task. I could have used my best chocolate frosting, or my chocolate fudge frosting but I wanted something a little different. 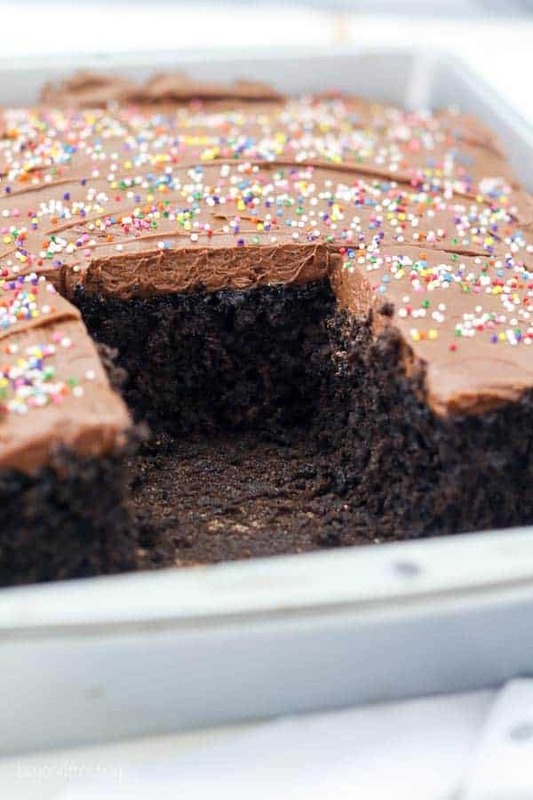 The chocolate cream cheese frosting is to-die-for! 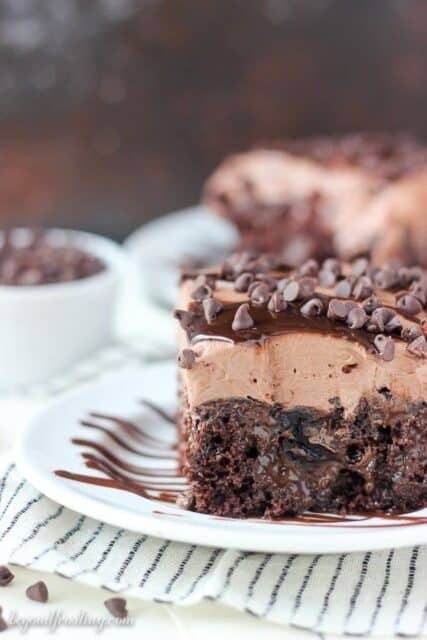 It’s ultra-creamy, whipped to perfection and not overly sweet, but it really adds the chocolate kick to finish off each bite. 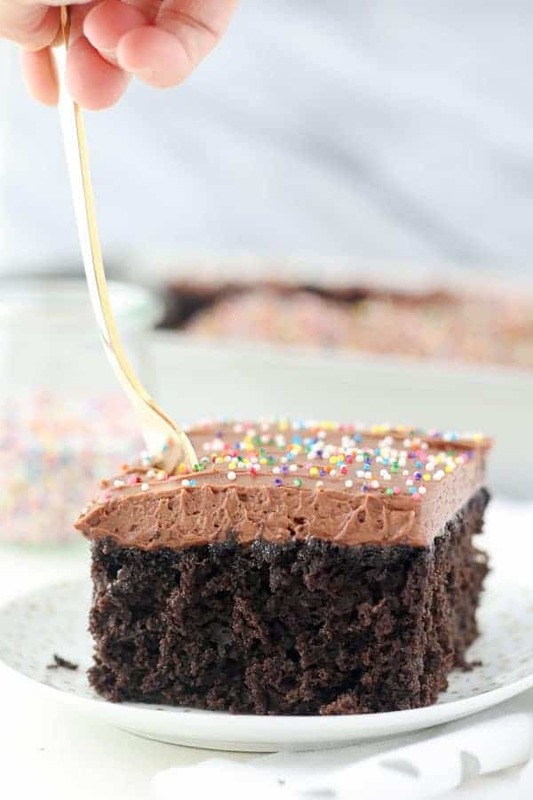 If you thought you had your favorite chocolate frosting recipe already, I assume you this chocolate cream cheese frosting will knock your recipe out of the water! If you’d prefer chocolate cupcakes, this recipe makes 24 chocolate cupcakes! You just have to adjust the frosting recipe by 1.5 times. Start with the sugar, eggs, oil and vanilla extract and beat them together until fluffy. Then add sour cream and beat until well combined. A get a lot of questions about substitutions for sour cream. I use light sour cream, it’s a little less dense than a full-fat sour cream. If you don’t have sour cream, I recommend using a nonfat Greek Yogurt. In a separate bowl, I combined my dry ingredients, which I sift together. I chose to sift the flour and cocoa powder because it will be easier for them to combine into the liquid ingredients. If you don’t have a sifter, you can also use a fine sieve. For the cocoa powder, I used Hershey’s Special Dark cocoa powder. You can definitely use regular cocoa powder as well, but I am a dark chocolate person. Sometimes I also like to add espresso powder to chocolate cakes, I think it helps intensify the chocolate flavor. The espresso powder is optional of course or can be substituted for a fine ground coffee. Then, add half the dry ingredients and half the liquid ingredients together and combine. The liquid ingredient in this cake is brewed coffee. You can use hot or cold coffee. 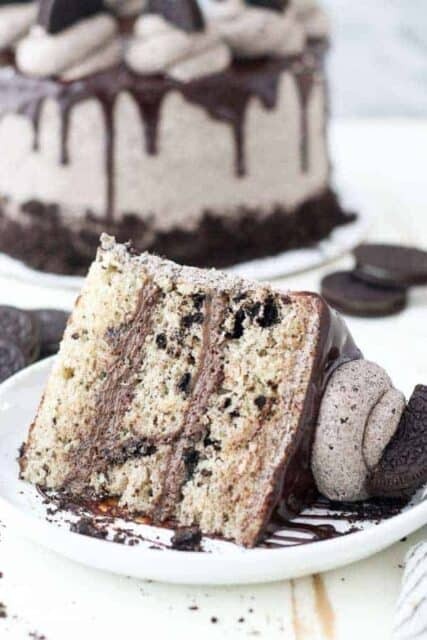 The coffee is what helps give this cake the extra dark color. If you’d like to substitute the coffee for another liquid ingredient, I recommend trying water. The coffee does help highlight the chocolate flavor in combination with the espresso powder. Can I use a Dutch processed cocoa powder for this recipe? Yes you can! I have tested this recipe with my favorite Dutch processed cocoa powder from Rodelle . 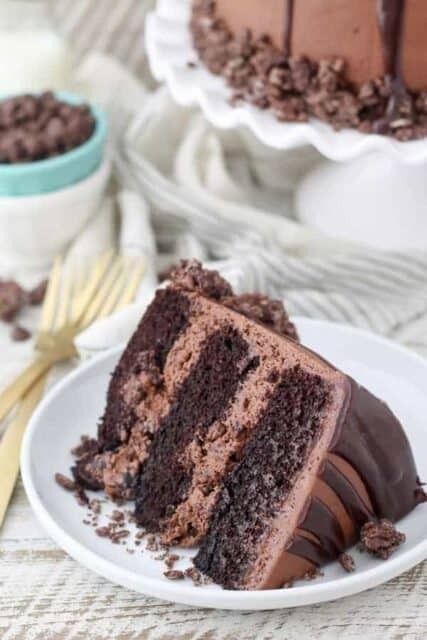 In order to make this chocolate cake with a dutch processed cocoa, adjust the baking powder to 2 teaspoons and then ADD 1/2 teaspoon baking soda (so 1 teaspoon total). The amount of cocoa powder is 1 to 1 with a regular unsweetened cocoa powder. Yes! 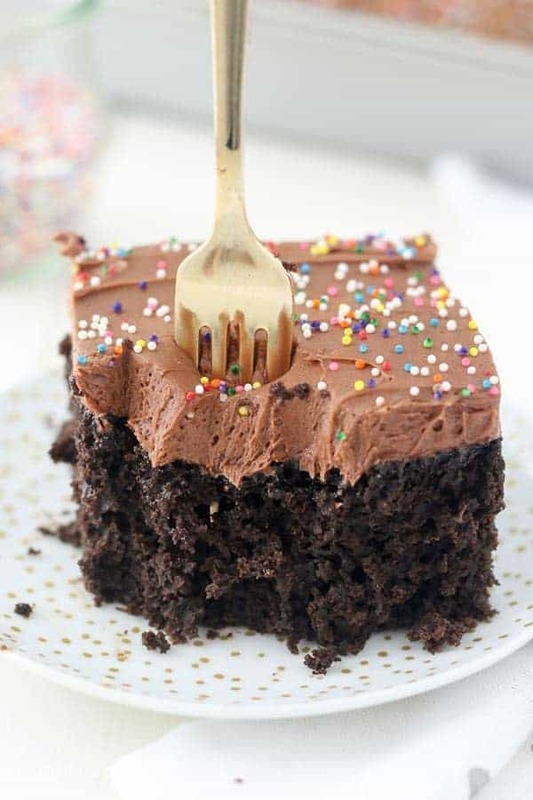 I have a Chocolate Cake Recipe that uses this same cake but with a different frosting. It will make a 3 layer 8-inch cake. To make the cream cheese frosting, start with a slightly softened butter. I usually leave it on the counter for about 20 minutes, and then slice it into cubes. You don’t want it to be too soft, but you should be able to easily run a knife through it. Start by beating the butter until it’s smooth and creamy and lighter in color. Then beat in the cream cheese until it’s smooth. The cream cheese does not need to be softened. Next add the cocoa powder and vanilla extract. You’ll want to beat the cocoa powder into the cream cheese for a couple minutes. For the frosting I like to use a standard cocoa powder, but the dark cocoa powder will work as well. Next, you’ll add 2 cups of powdered sugar at a time and some of the heavy whipping cream, beating each time until the frosting is completely smooth. The more you whip it together, the more airy the frosting will be. If you’re not comfortable making frosting, I have a whole tutorial about how to make buttercream frosting. Even though this is a cream cheese frosting, you might find some helpful tips in that post. 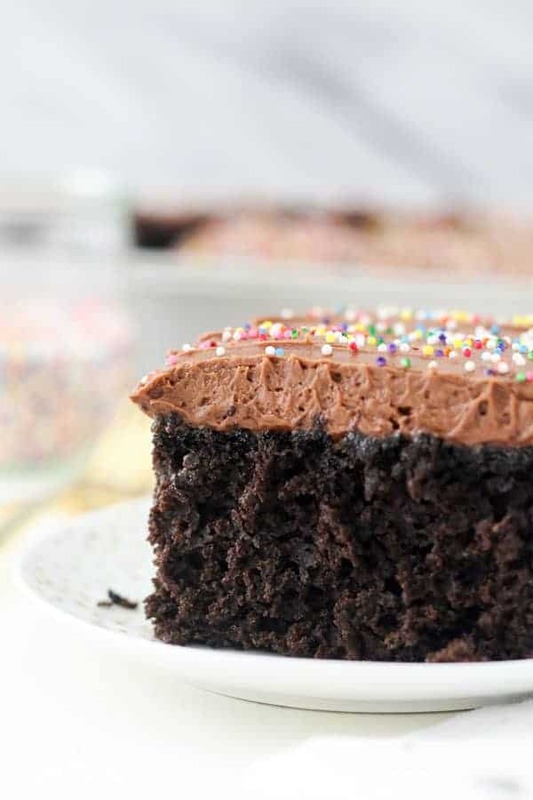 This frosting spreads so easily, it’s perfect for cake or cupcakes! Now there are few things my husband loves more than chocolate cake with chocolate frosting. I was delighted when he said he LOVED this cake, and even asked for another slice. His dessert resistance is so high, except around chocolate cake. I hope you’re ready for all the chocolate cakes and cupcake to come! 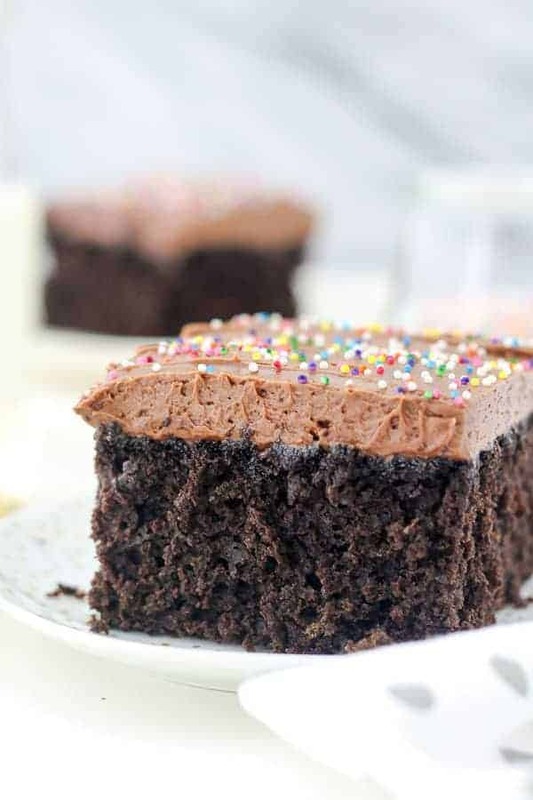 This mouthwatering, super moist chocolate cake, is a homemade chocolate cake topped with a silky chocolate cream cheese frosting. 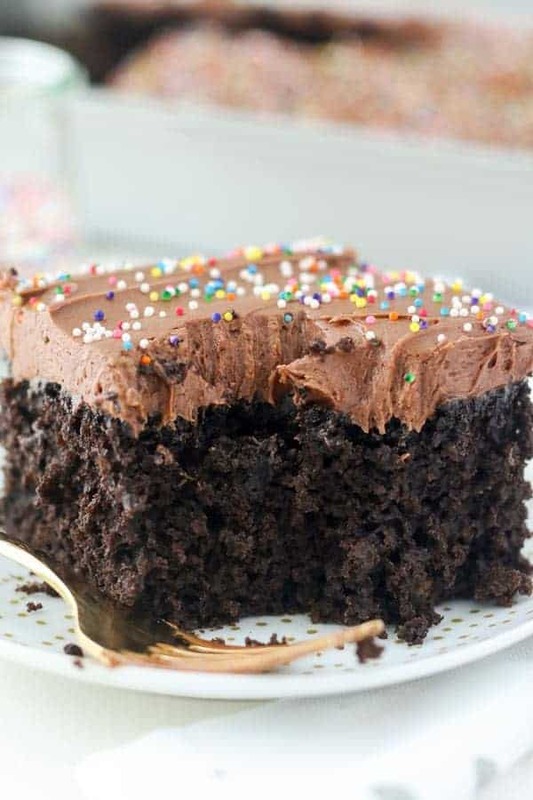 The chocolate cake just melts in your mouth, it’s a light and fluffy cake that stays moist for days. Pour the batter into a 9×13-inch pan and bake at 350°F for 26-28 minutes. Test the cake for doneness by inserting a toothpick into the center of the cake. If the toothpick comes out clean, your cake is done. Remove from the oven and allow to cool completely. For the frosting: Cut the butter into 1-inch blocks. Beat the butter for 1-2 minutes until it is slightly softened. Then add the cream cheese and cream together for 2-3 minutes until they are fluffy and free of lumps, scape down the bowl occasionally. Next, add the confectionary sugar 2 cups at a time, followed by one tablespoon of heavy whipping cream and beat for 60-90 seconds until completely smooth. Add the remaining powdered sugar and heavy whipping cream and beat until desired consistency, at least 2 minutes. Spread frosting over cooled cake and then cover with sprinkles. Keep in an airtight container. 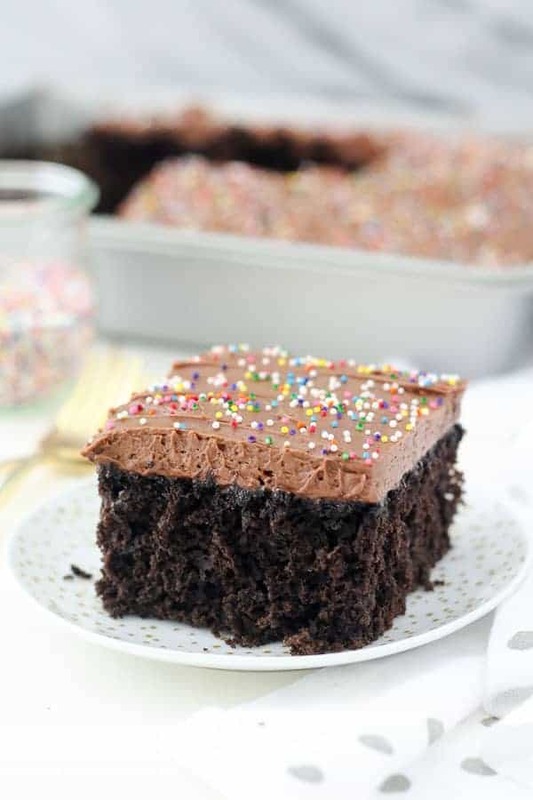 I prefer to use Hershey’s Special Dark Cocoa Powder for the cake and regular cocoa powder for the frosting. If you don’t want to use coffee, you can use water. I tried this and the cake is just ok. Not quite as special as I expected it to be basing from the write up. For the frosting, I already lessened butter and sugar yet it still tastes way tooooo sweet. I tried remedying it with Greek yogurt but was still too sweet. My husband just made it into a chocolate drink instead since only lots of water could lessen the sweetness. Hi there, I am sorry you didn’t like it. Although I think it’s a personal taste that differs between each person. I am not sure I quite understand what adjustment you made to the frosting. Water will not do much for lessening sweetness, instead I’d recommend milk or heavy cream and a pinch of salt. I followed the recipe exactly. I found the cake to be bland and boring. It wasn’t as moist or fluffy as I thought. Disappointing as I made this for Valentine’s day. Hi there, I am sorry you didn’t like it. Although I think it’s a personal taste that differs between each person. I’ve made this recipe dozens and dozens of times and it gets great reviews. The cake is more mild chocolate tasting so that it isn’t overly sweet once the frosting has been added.